There are two options: 1) Work through the worksheets below in order – the sequence they are in roughly matches the order that your child is being taught topics at school during the year or 2) Open the email we'll send you every Wednesday with recommendations for two worksheets to complete that week (one English, one maths). There are also 24 fun worksheets that we'll send you during the school holidays! For more information, we'd recommend you read Year 1 English: what your child learns. Don't forget! We have a whole section of the site about Year 1 English where you'll find even more articles, games, worksheets and activities. Full stop or exclamation mark? Reading, writing and spelling practice for KS1 children means wordsearches, matching games, writing missing posters and more! 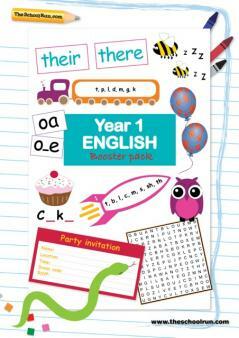 Our Year 1 English booster pack covers all the main literacy topics your child will learn in Year 1 and will help keep them engaged with words. Just one worksheet a day will offer a fun revision session to help them with their handwriting, phonics and punctuation – and why not let your child organise a little party to make the 'writing for purpose' activity even more exciting? Your child will do lots of phonics learning at school – so why not use games to help them put their new skills into practice at home?